Most of the work we do is based on function and performance. But every once in a while, our craftsmen get to deviate from the norm and create special works of art. 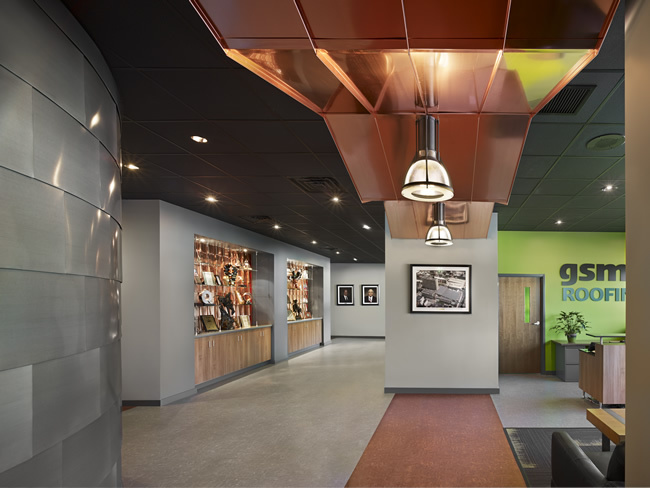 The InsideOut Inspiration Gallery at our company’s Ephrata, PA headquarters is one amazing example of what our team is truly capable of creating. With the help of Tono Interior Architects and Horst Construction, our headquarters was transformed into a dynamic workspace and inspiring showroom. From our lobby to the award-winning 7,000 square-foot green roof, our employees and visitors are surrounded by examples of GSM products and innovation. The curved wall that greets visitors features 8mm Rheinzink staggered horizontal panels that were fabricated in our shop. It was inspired by a job we did on the George Mason University Astronomy Observatory in Fairfax, VA. We used the vertical seam design to create a spiraling effect. Our lobby columns feature .040 aluminum in oil-rubbed bronze finish. This feature resembles the siding and soffit panels that are used on many GSM Roofing jobs. The lobby cloud is made of 24-gauge copper. Each single-lock panel was fabricated by GSM. 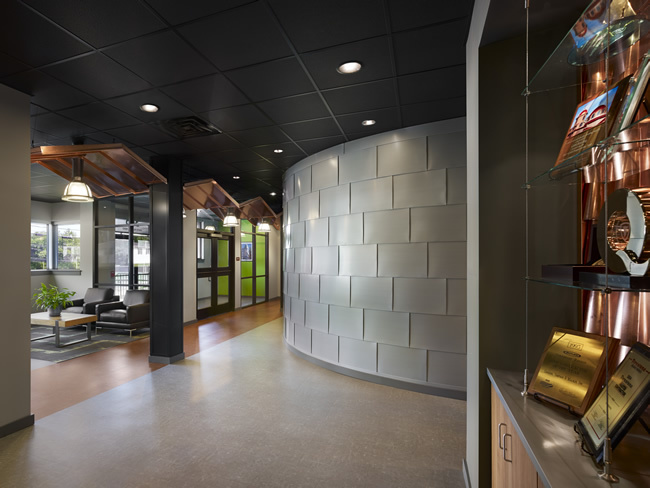 This design was inspired by our work on the D.gallery in Gladwyne, PA, which was awarded the 2010 Gold Circle Award for Innovative Solutions in New Construction. 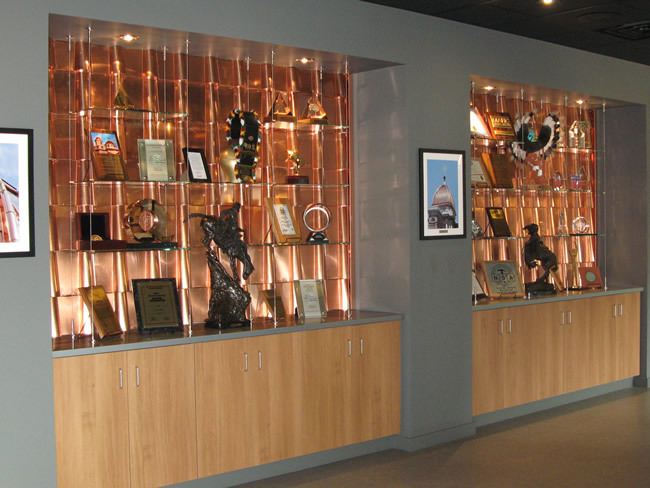 Our awards display is crafted from Copper Plus® 24-gauge panels. The Spanish tile design was inspired by the meticulous dome restoration work we did at First Lutheran Church in Carlisle, PA. It features 650 copper tiles handcrafted by GSM before careful installation. 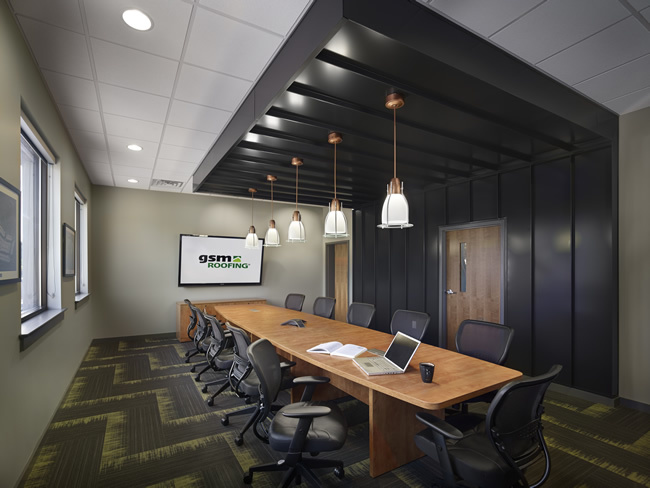 Our conference room features an upside-down standing seam metal roof that was inspired by a 16-inch wide Una-Clad 24 gauge steel snap-lock panel with Kynar finish new construction roof job we did for Lancaster, PA-based RLPS Architects. One of our specialties is slate roof design and installation – as shown in our work at Bryn Mawr College in Bryn Mawr, PA. We’ve mastered this craft so well that the National Slate Association asked GSM to help write the new manual on designing and installing slate roofs. 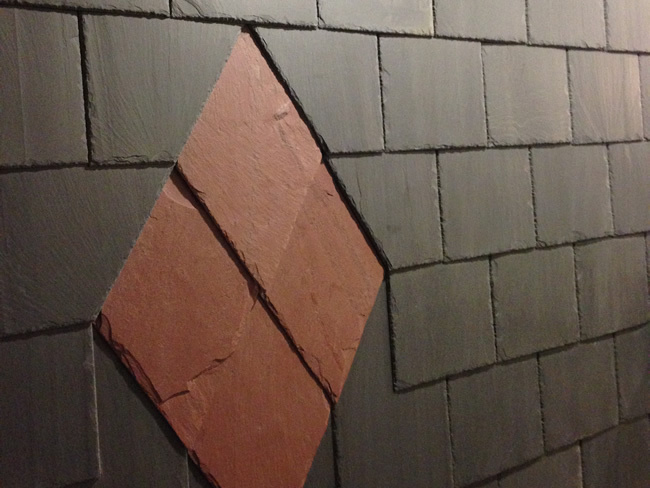 Our Inspiration Gallery features two slate walls. Our building’s jewel is the 7,000 sq. ft. Green Roof with vegetative garden (adorned with 13,000 sedums and flowering perennials), walkway, outdoor seating with grilling area, and custom-made rain barrels. Multiple prismatic skylights balance the building’s electrical pull with natural lighting. 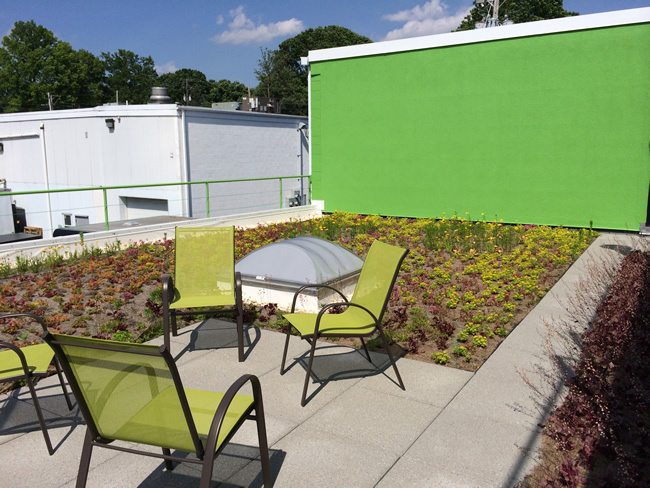 Besides the environmental benefits, a rooftop like ours increases usable square footage and adds a tremendous employee benefit. Our green roof received the 2013 RoofPoint Excellence in Design Award for Excellence in Water Management – for inspiration in vegetative roofing, water harvesting and roof safety solutions. Explore our collection of performance-delivering roof and wall panel systems, innovative ceiling and interior cladding concepts, and green roof environment. Email Nancy Miller or call her at 800-532-7663 to schedule a gallery tour with GSM Roofing owners Reed Gooding or Will Gooding or to organize a Lunch & Learn for your group.